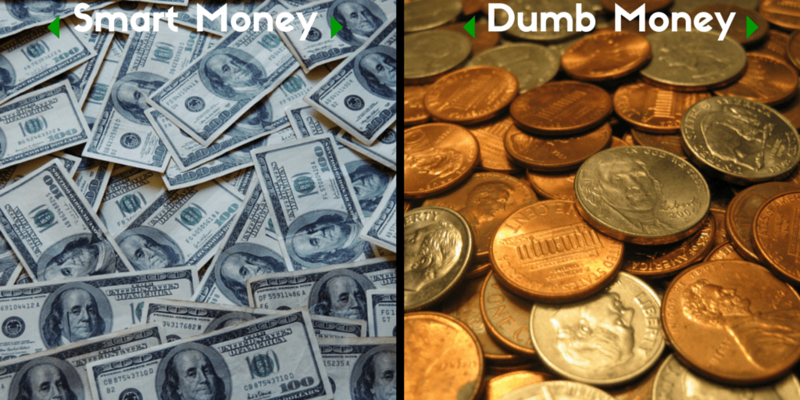 Common sense would tell us that money is money, and that it is all the same. Let us introduce you to “smart money”. You’ve decided to start a startup and now you either have an MVP, released your product, or you are still in the idea phase. At some point (each startup chooses to raise funds at a different stage) you are going to go out and try to raise enough money to scale and grow your business. The common factor between your fundraising and all the rest is the money. The difference is the type of money you take. Cash invested or wagered by those considered to be experienced, well-informed, “in-the-know” or all three. Although there is little empirical evidence to support the notion that smart-money investments perform any better than non-smart-money investments do, many speculation methods take such influxes of cash very seriously. Money: it’s what helps you scale your company and create something that has an effect on people. Dumb Money: you get the money needed to create your business, but in addition you get someone with little clue as to what is going on or, maybe even worse, thinks he/she is some kind of exterior CEO. Smart Money: you get the money needed to create your business, and as a nice bonus you get someone that actually knows what they are talking about and hence can hand out great advice, tips, and introductions to other “smart” people. With smart money, you are adding value and money to your company at the same time, so that although on paper it may look like a $1 million dollar investment, in reality it is more. How much more? That is almost too difficult to measure in terms of specific ROI, just like relationships. Connections: Why do so many startups flock to Silicon Valley? One of the leading reasons is that no matter where you go, if it’s coffee in the morning or a run in the evening, you never know who exactly you’ll run into. You do however know that at every corner there is someone important and valued to meet; Colleagues, investors, and experienced mentors can all be found on a daily basis. With “smart money”, not only would a transition into the the Valley be made easier, but it would also ensure that from day 1 you are able to meet with those people that can help you and your investors reach the intended goal. Stamp of Approval: one of the greatest parts of finishing participation in an accelerator like Y Combinator or MassChallenge is having a huge target on your back. This time though, that target is a good one and is more like a magnet than a target. The same rationale goes for successfully raising smart money. Smart money acts as your stamp of approval for having, or at least seemingly having, a winning product or service. The Two E’s – Experience and Expertise: Every startup hits a fork in the road. It’s at this time that not only does having great employees pay off, but also having experienced investors that have gained expertise from dealing with startups and other businesses that have faced similar situations. When there are three co-founders in their 20 somethings needing to make a game-changing decisions to their startup, having someone to meet with that might be more “business-savvy” is irreplaceable and sometimes the missing piece of the puzzle. Obviously all of those advantages make running a startup, a sometimes stressful venture, somewhat a little less stressful. Do you have to take smart money? Again, it’s obvious that you don’t and each startup, based on their personnel and the product’s stage will decide what is best suited for the company’s future. If you do want to find smart money, consider the following. Every VC and angel investor has a niche. Certain VCs have more than one niche, with each partner having his/her area of expertise. Start by amassing a list of every investor/VC that has invested in your niche in the last year or two. Then start looking into how successful they were as an investor in your field. Where are the startups today? Have they had another round of funding? Have the companies had a lack of stability? What did they do before investing? Think of it as researching a doctor to perform open-hear surgery on you – you want the best. After you’ve create a list of preferred investors consider bringing up some of these questions in a conversation or meeting. What do you think of us adding another location? At the end of the day, you want someone behind you that you would be willing to go to a deserted island with, or at minimum, someone you’d consider adding as a co-founder, or employee. Which kind of money are you going to take? If behind every successful man is a woman then behind every successful startup is a smart investor. Dan Ariely on Dishonesty and the Slippery SlopeDoes It Make Sense for Google to Acquire Twitter?